He works the crowd brilliantly, stopping to chat informally, shake outstretched hands and pose for photographs with his lovely wife. He smiles and quips, and has perfected that Bill Clinton gesture of pointing and waving into the middle distance of the throng. If you are the chosen one it's as if you've been singled out for special attention. To the outside observer it looks as if he's recognised and remembered someone in the anonymous mass of smiling faces. Yes, to watch Will Smith arrive at the Sydney premiere of his latest movie is like seeing a political candidate in action. And not long ago Smith told Oprah Winfrey he wouldn't discount the idea that he could be President. Well, Ronald Reagan did it, and he didn't have anything like the career successes of Smith whose latest movie, Ali, has him up for an Oscar for best actor. And if anyone could charm their way into public office it would be Smith. Sitting in a suite in Sydney's Park Hyatt with the Opera House just beyond the rain-spattered glass, Smith is relaxed, astute and quote-friendly. He's also scrupulously polite (journalists aren't used to being greeted with, "How do you do, sir?") as he talks up his role as Muhammad Ali in the Michael Mann-directed feature. This is Smith in casual mode, but from the military polish of his black shoes and sharp crease in his trousers to the immaculately cropped curls, he is perfectly presented, his crisp white shirt hanging open to reveal a grey T-shirt and little evidence of the weight he had to put on to play the former heavyweight champion and cultural icon. He repeatedly says this was his most ambitious and difficult role yet in a film career which includes the highly regarded Six Degrees of Separation and box-office smashes Men In Black and Independence Day. 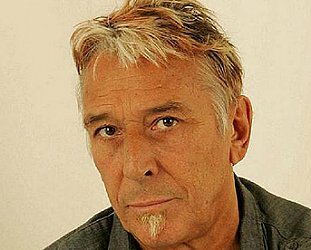 He's appeared in the thriller Enemy of the State, and Wild Wild West, which took more than $US250 million ($593 million) and included his hit theme. He recorded with DJ Jazzy Jeff as the Fresh Prince, and his solo albums Big Willie Style and Willennium have sold around 12 million in total. And there was the television series The Fresh Prince of Bel Air. It's an impressive "portfolio," to use his term. But nothing has challenged him like Ali which covers the former champion's life from his defeat of Sonny Liston in 1964 for the title, through being stripped of the crown for his refusal to be inducted into the US Army during the Vietnam War, to regaining the title in 1974 at the Don King-promoted "Rumble in the Jungle" against George Foreman in Zaire. It was a volatile decade in which Ali and the world changed. The fighter went from Cassius Clay to Muhammad Ali when he adopted the Muslim faith, there were the killing of his friends soul singer Sam Cooke and Malcolm X, the assassination of Martin Luther King, and for Ali there were also wives and "the casuals", as actress Nona Gaye (daughter of Marvin) says in her role as Ali's second wife Belinda Boyd. Ali was a complex and controversial figure, and Smith was first approached for the part six years ago but felt he wasn't "physically, emotionally and intellectually prepared to take on the greatest role of my life." 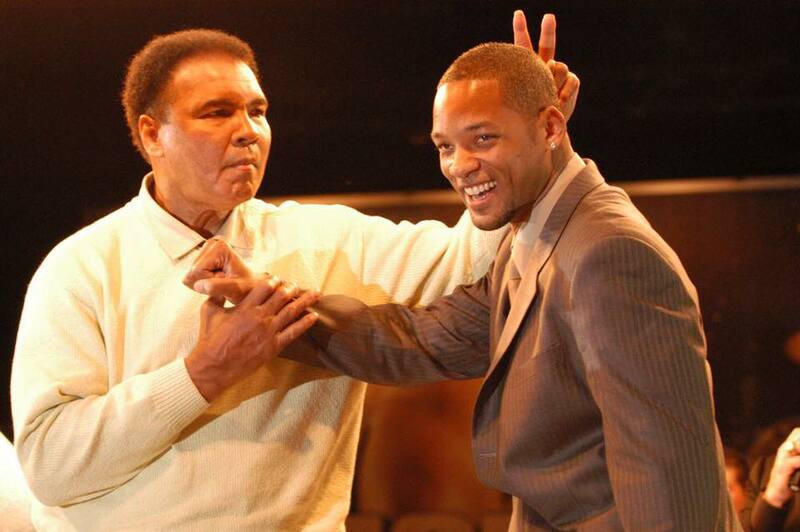 He met Ali for the first time the following week. "It was at the NAACP image awards and my timing was a little off," he laughs. "He said, 'You ain't pretty enough to play me anyway'. I said, 'Champ, it's just that I have too much respect for your family and legacy to be the dude who messed up the Muhammad Ali story.' He understood and said to just keep it in mind. "His daughters evidently used to watch Fresh Prince of Bel Air and said if there was going to be a movie I was right to play him. One of his daughters used to hang in Philly a lot and I used to see her and she always said, 'You remind me of dad'. "Howard Bingham [longtime Ali friend and in-house photographer] has called me Cassius for eight years. I don't think he's ever called me Will. They saw something and Michael Mann saw it too. I was the only person that didn't." 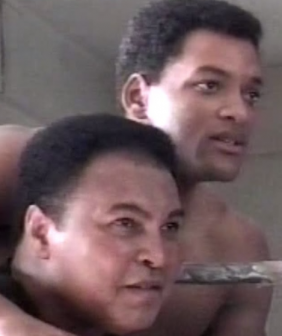 The turning point was director Mann articulating "the curriculum for becoming Muhammad Ali" and a three-tier programme working through Smith's physical development, then the emotional dimension of Ali, and finally learning Ali's spirituality by identifying his Islamic beliefs and working back to how he came to them. "It was a long haul, a year of physical preparation prior to six months of shooting. It's a year and a half out of your life when you are essentially another person. There are certain difficulties which come into play, which is why you see actors marrying actors a lot, because it's such a bizarre job." To make the weight and get into shape - in Ali he fights real-life boxers playing Liston, Joe Frazier, Ernie Terrell and Foreman - Smith was in the gym every morning pushing weights, doing ring work and pounding the pavements. He put on 16kg in four months and took lessons from professional fighters. Much harder, however, was locating that territory between the man and the myth. There's no shortage of information about Ali, not the least from the man himself and his friends. 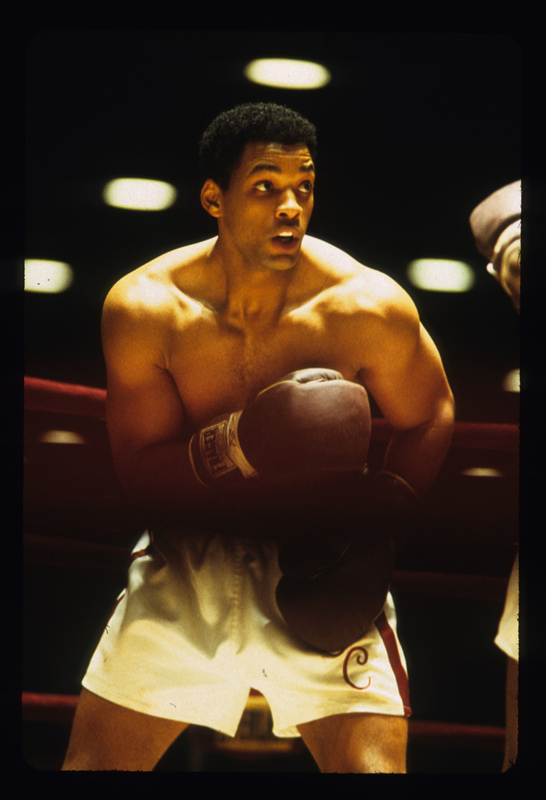 Smith cites Thomas Hauser's definitive oral biography Muhammad Ali: His Life and Times as crucial in his understanding, but they also had access to 17 hours of previously unseen footage shot by Leon Gast for his Oscar-winning documentary, When We Were Kings, about the Rumble in the Jungle. "We had Ali watching James Brown perform, and we had Ali quiet, it was broken down into sections. One we called Ali As Baptist Preacher when he's full-on ranting and raving, we have Ali tired, Ali hoarse, Ali with women ... we had so many different and candid moments that it gave us almost everything we needed to create the interpretation." 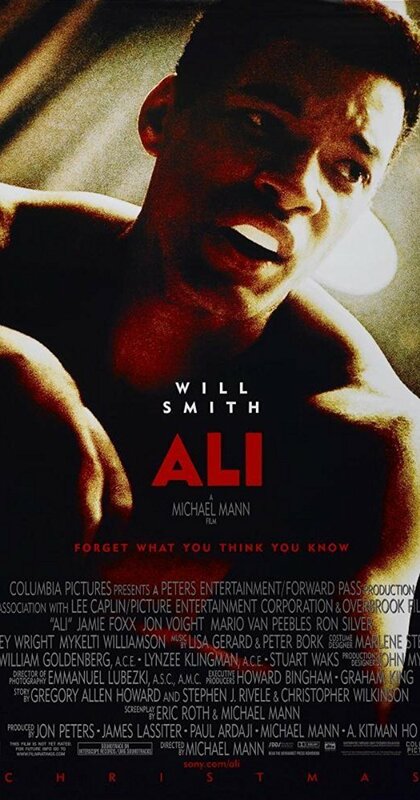 While some have quibbled about aspects of the film Smith's portrayal - at times penetrating, at others recreating iconic moments from Ali's much publicised and filmed life - has been almost universally hailed and he effectively replicates the cadences of Ali's distinctive voice. The difficulty with Ali is that as much as he, as Hauser says, "has become immortal in his own lifetime," there are generations - Smith's included - who have little idea of his achievements and the period. 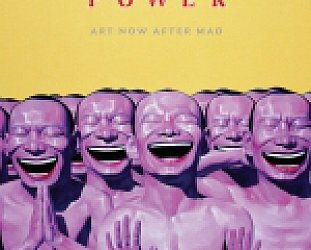 That makes for an irony in the film's tag-line "Forget what you think you know." Many know nothing. "Oh sure, I wasn't born until 1968 so everything I know about Ali was essentially just what my parents said. I had a sense of who he was, I knew he was important and that everyone clapped when he walked into a room. I knew he was revered, but I didn't know why, which was part of the importance of making the film because anyone younger than me has no idea about him." "That whole period is foreign to young blacks in America. Riding on the back of the bus? Man, Puffy has his own bus these days! That was the biggest struggle I had, getting a grip on the black American perspective during the era." The movie doesn't shy away from some of the controversies surrounding Ali (it does avoid his overtly racist statements) and Ali allows the audience to see his scientific ring work and psychological ploys to upset opponents. Smith says he came away from Ali with greater respect for the man and boxers. "You have to be a fighter to really understand boxing. I enjoy fights much more now because I'm seeing smaller things, and I see the cheating. You watch Mike Tyson, when he throws a hook he puts the elbow behind it. But unless you slow the film down you don't see it, and the fighter doesn't know he got hit with the elbow. He's stunned, anyway." With Ali behind him Smith is now focusing on other things: Men in Black 2 is released mid-year, and there's a new album out in a month. We joke about that comment on Oprah and the man who has dinners with Nelson Mandela roars with laughter. We agree, after you've played The Greatest, being President would just be a disappointment.